After the feedback fades into silence, after the last snare drum’s concluding echo, there is a definitive feeling of having experienced something as unique and rare as a two-horned unicorn. When Eyedea won HBO’s Blaze Battle in 2000 he seemed poised to launch a career of glitzy video shoots replete with booty, braggadocio, and bling. Instead he remained loyal to longtime friend and partner DJ Abilities and released the minimalist internal examination of self in the context of hip-hop, First Born. Thoughtful and reflective, it was hardly the swaggering banger expected of a freestyle battle champion. Whether you call it backpacker ballyhoo, emo rap, or urban intellectualism it earned Eyedea & Abilities the respect of the underground community and established them as a powerfully creative emcee and DJ team. Several years and side projects later Eyedea & Abilities returned with the nominal E & A, a finely crafted return to form and nod to hip-hop’s golden era. The beats were stronger and recalled the deft sample-flipping of DJ Premier if he’d relied more on scratching and less on looping. 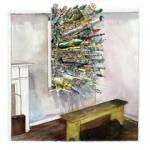 Still, they remained uncluttered and allowed Eyedea to glide over each track with his nasally delivery and a revamped focus on asserting himself. It was undoubtedly progression, one of the keys to career longevity, and with this in mind it makes sense that the pair would release the rock-infused By the Throat, especially given Eyedea’s grungy outlet, Carbon Carnival. In many ways their latest effort is a departure from what fans may expect or even want, trading in a crisp less-is-more attitude for a roughness around the edges in the form of guitars and distorted drums, and traditional rapping cadences for occasional bouts of singing. The latter in particular seems to be a pervasive trend beginning to penetrate the genre, but on By the Throat it’s done so fittingly, so appropriately, that it enhances the overall quality of the album like a good wine does for a dinner. The intro “Hay Fever” sets the tone accordingly, building up the punk-like style into a brooding chorus. “Spin Cycle” uses a similar approach, but this time with more rock, a little roll, and some hip-hop know-how. It’s not until “Burn Fetish” that the Eyedea of yore truly reintroduces himself over the boom-bap workmanship of Abilities, reminding the listener that “Empathy is the poor man’s cocaine/ And love is just a chemical by any other name.” It’s a bleak approach to social interaction, to be sure, but it’s also more realistic and apt than the casual hip-hop fan would care to admit. “Junk” is easily the album's best track, marauding over a chunky bassline that leads into another singing chorus eerily reminiscent of something Kurt Cobain might have done. Eyedea reprises his alter ego Oliver Hart and displays his storytelling skills with the bittersweet optimism of “Smile,” proving that there is no better way to avoid being pigeonholed than to be diverse. After the feedback of By the Throat fades into silence, after the last snare drum’s concluding echo, there is a definitive feeling of having experienced something as unique and rare as a two-horned unicorn. Blending hip-hop and rock is no easy task, despite what mainstream blockbuster soundtrack producers Linkin Park may lead you to believe, but Eyedea & Abilities open themselves up to the scrutiny of their independent peers and succeed with compelling verve. As dynamic bandmates should Eyedea & Abilities excel at making each other better with innovative beats and rhymes that vary from rapidfire to reserved to rapacious. By the Throat, succinct and emotive, is the perfect convergence of styles, attacking the listener’s jugular with a powerful punk thrust, cynical observations, and an out-and-out assault on hip-hop’s standards.